abstract This section helps you quickly get started with Android Automation. The machine needs to have Android Platform Tools installed so that ADB is available in the system. Having a full blown Android SDK is even better. 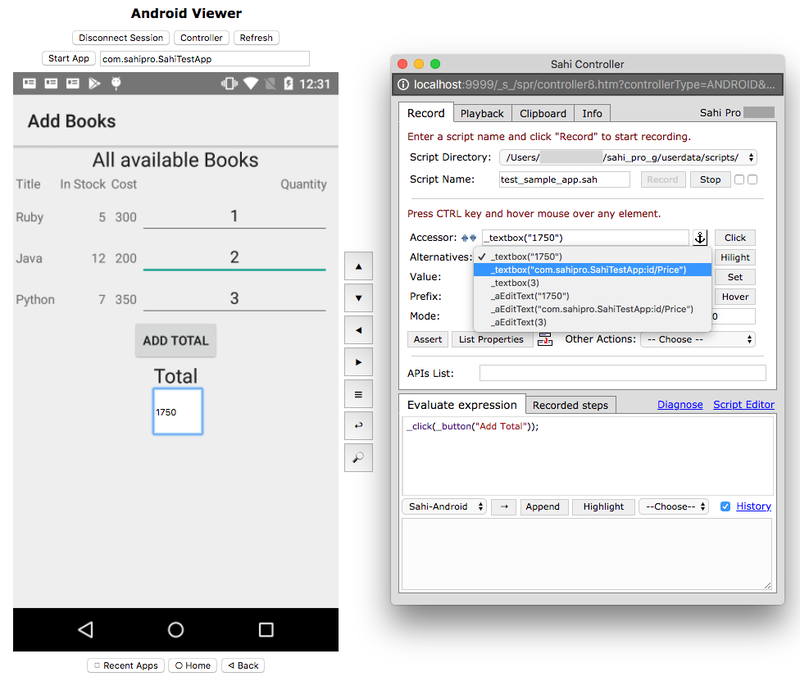 Make sure the path to the Android Platform Tools folder is added to the PATH environment variable. To test this, open a command prompt and type adb (or adb.exe). ADB should start up if the Android Platform Tools folder is in the PATH. Connect the device. Enable USB debugging from Settings -> Developer options. To enable Developer options, go to Setting -> About phone -> scroll to Build number and tap it 7 times. If you already have the driver for the device installed, you should now be connected through adb. If not, install the USB driver for the device. The device has to be connected through USB cable throughout the duration of the test. Alternatively, you can setup adb over Wi-Fi as well if you do not wish to tether the device. Screen lock should be removed and display options should be set such that the device does not sleep throughout the execution of the script. When the device is connected for the first time, you may get an alert asking for permission to connect. Set it to always accept the connection. To know the device ID which is connected to the machine, type adb devices in command prompt. 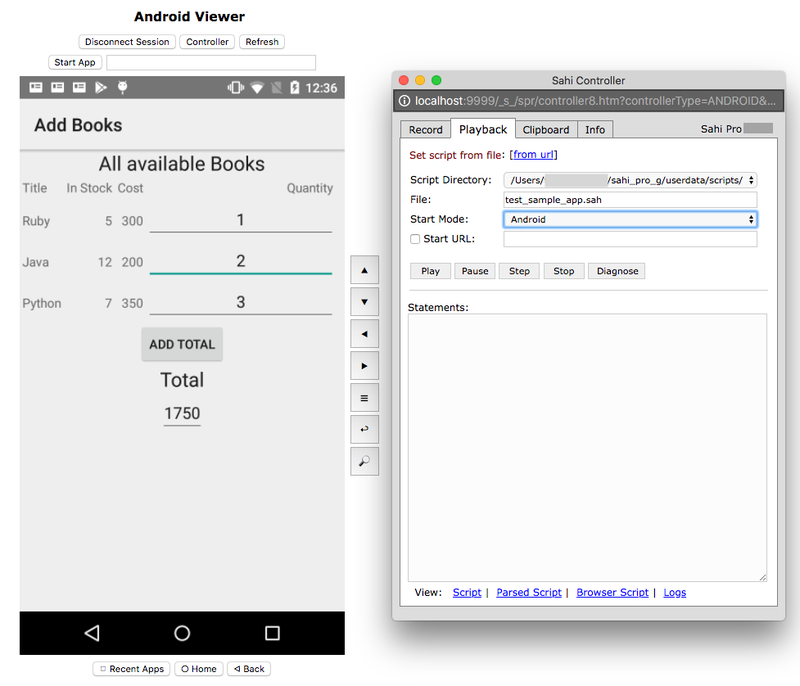 Connect the Android Device to the system. 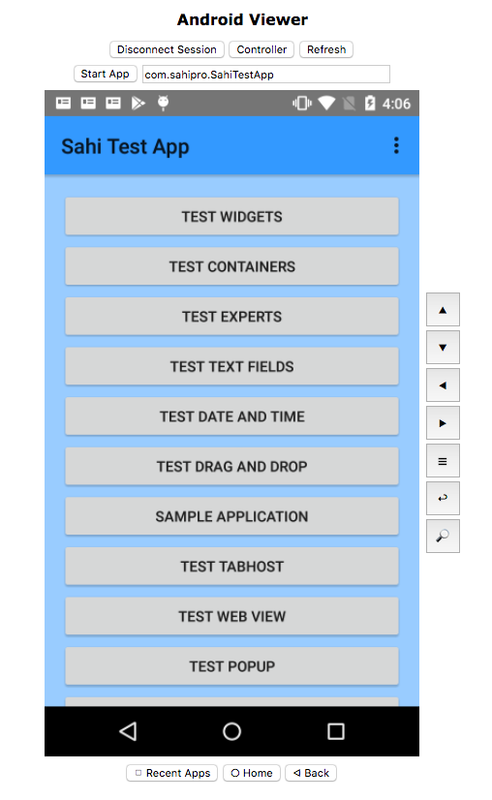 Install the Sample Application <SAHI_INSTALLATION_FOLDER>/userdata/android/testapps/AndroidApp.apk on the device. Type cd <SAHI_INSTALLATION_FOLDER>/userdata/android/testapps and press enter. Type adb install AndroidApp.apk and press enter to install the app. Start Sahi Dashboard and click on the Android button. 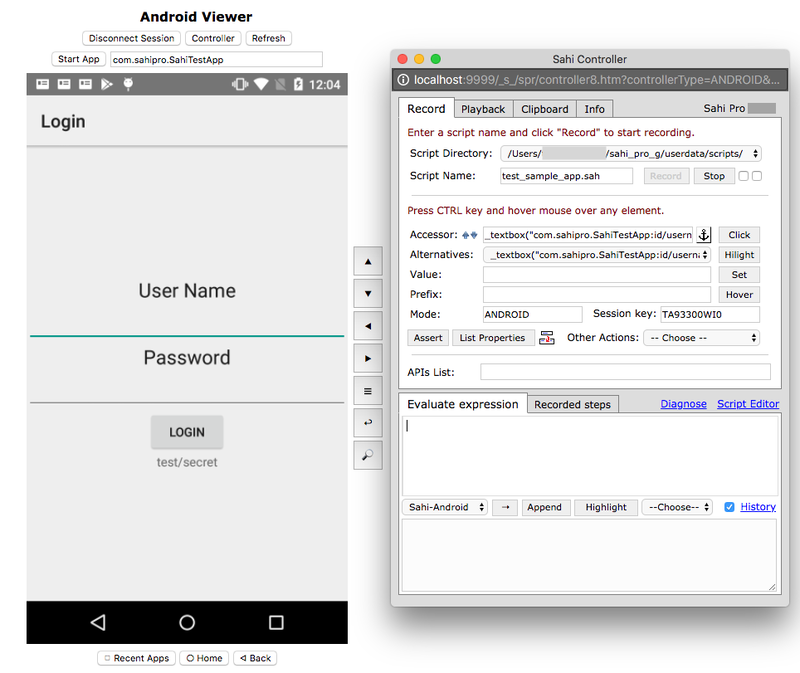 This brings up Android Viewer in system's default browser. Now click on Connect Session button. This will start com.sahipro.SahiTestApp application in Android device. The device screen is also visible on the Android Viewer. 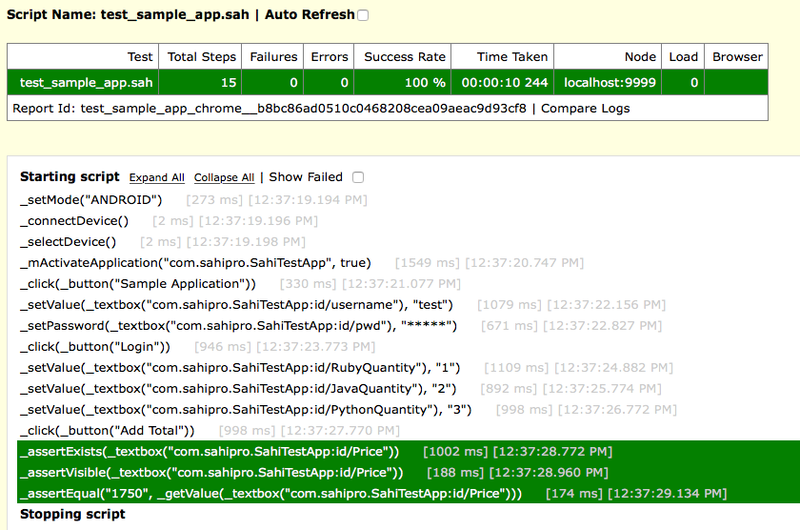 Specify a script name (test_sample_app.sah) in Controller and click on Record button. 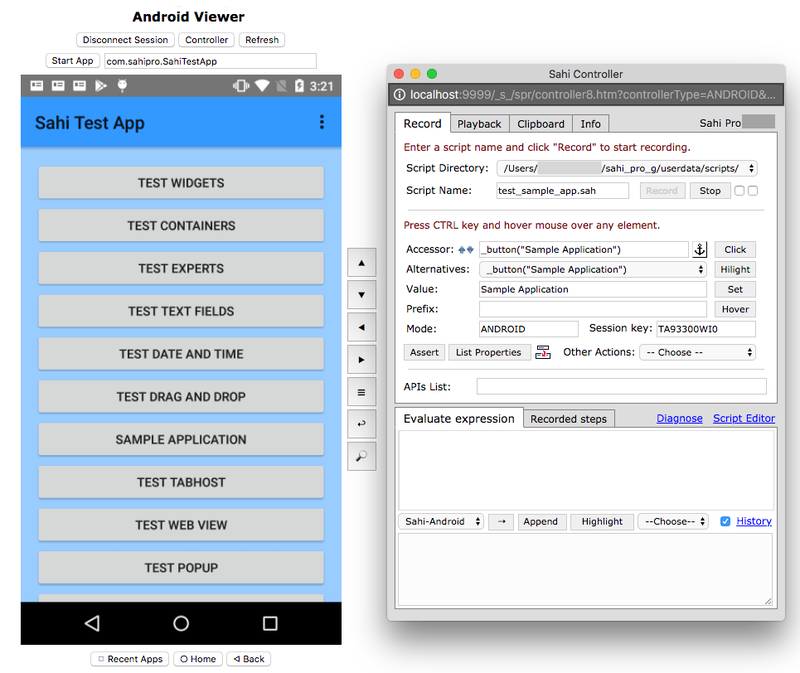 Now on the Android Viewer click the Sample Application button. This will bring up the Login screen. Click on the textbox below User Name. This makes the element editable in the Viewer. Type "test" in textbox and press enter. Click on the textbox below Password. This brings up the textbox on the screenshot where you can specify the Password. Type "secret" in textbox and press enter. Click on the Login button. 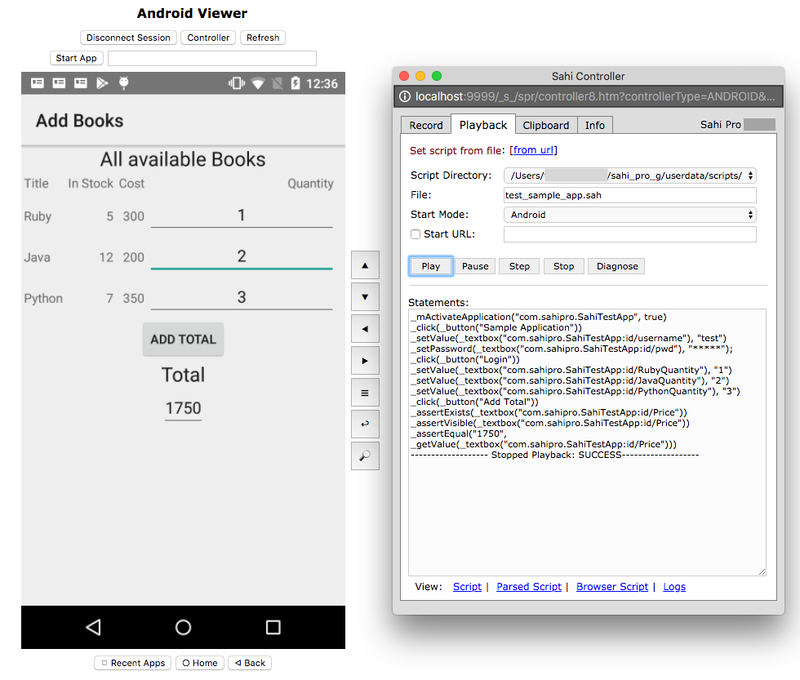 This will brings up the Add Books screen. Click on the textbox right side of Ruby. This brings the textbox on the screenshot where you can specify the number of books. Click on the textbox right side of Java. This brings the textbox on the screenshot where you can specify the number of books. Click on the textbox right side of Python. 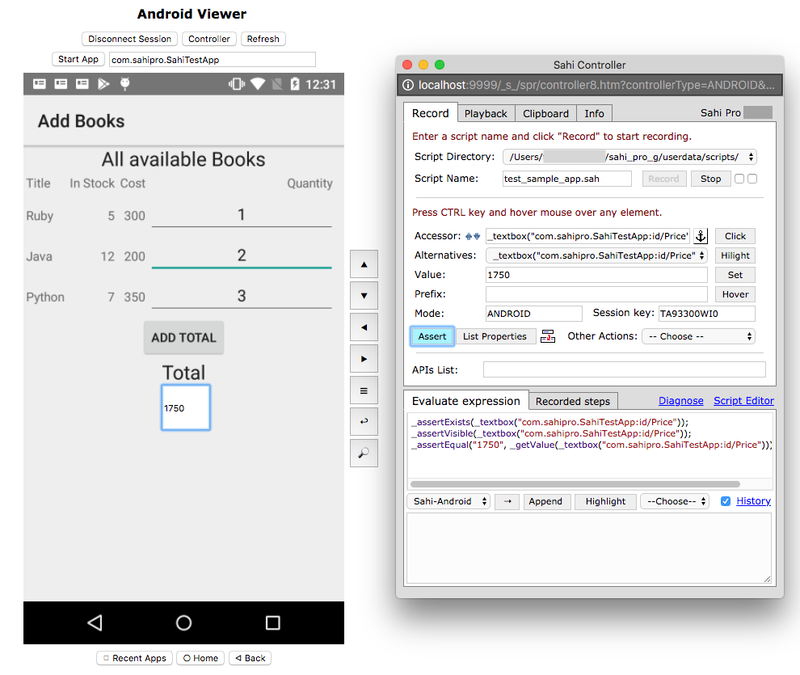 This brings the textbox on the screenshot where you can specify the number of books. Click on the Add Total button. This will sums up the cost of all three books. Press the CTRL key and hover the mouse over the textbox below Total. Click on the Assert button which will generate the valid assertions for that textbox. Click on the Append button which will append the assertions in the script. Stop the recording of the script by clicking on the Stop button from Controller. Check the recorded script by clicking on Script Editor from controller. The script looks like this. Now click on the Play button. This will start the script execution. You can see the steps being executed on the actual device/simulator. infoWhen the script is being played back from the Controller, you CANNOT see the playback happening on the Android Viewer. The Android Viewer does not get refreshed during playback. You can see the result of the executed script in the Controller itself. For checking the logs of the executed script, click on the Logs link from Controller. This will open a script report of that script.